Is 7 really a lucky number? For me it is. Or at least I think it is. 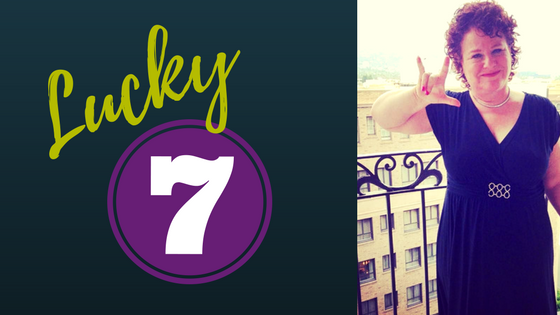 You see, I realized this week that the number seven has resonated with me throughout my thyroid cancer journey. Yet, only recently did I connect the dots as to why it is indeed “lucky” or at least significant. 7a.m – The time I arrived to the surgical unit for my operation. Seven hours. The number of hours Dr. Ralph Tufano, (my hero) performed surgery on me at Johns Hopkins Hospital. Seven weeks. That was the time it took for me to get my voice sounding more like me and less like a prank phone caller. Seven years have passed since January 5, 2011 when I had my surgery and my life was forever changed. You may think this was a tantamount day filled with dread, but in reality many amazing things have happened from that day forward. Related articles: If you are interested in the “whole saga” here is a link. 7 is the number of continents in the world. Go explore them while you can. 7 good friends is better than a lot of people pretending to be your friend. 7 pairs of shoes may be an Ok amount, but in reality I own three times that number. Social media forums cite 7pm as a popular time to be online engaging with others and reading articles. 7 is considered one of the luckiest numbers, according to Quora, because there are Seven Seas, Seven Heavens, Seven Continents, Seven Colors in a Rainbow, Seven Notes on a musical scale, Seven Days in a week, Seven Wonders of the World and so on. Seven is considered to represent the “extraordinary”. 7 is the number of chakras the body possesses. Seven minutes can be all it takes to check your neck with an ultra-sound to see if you have a healthy or unhealthy thyroid. Seven minutes- worth every one of them. First, be your own health advocate. If you feel that something isn’t right with your health – go see a doctor or two if you are not satisfied with the first opinion. Next, CHECK YOUR NECK. At least once a year – have your doctor check your neck for irregularities. Are you gaining weight suddenly or losing it without dieting? Do you have a chronic sore throat or persistent cough. These are all red flags that something could be amiss and a due to a thyroid issue! Each year, since my cancer journey began, I spotlight ways to help people who are diagnosed and living with cancer. This year I am asking that readers of my blog consider supporting the CYCLE FOR SURVIVAL campaign. My daughter, Natasha, is participating with the Cycle for Survival fundraiser and any support would be greatly appreciated. Here is the link. EVERY DOLLAR RAISED goes towards funding research for rare cancers via the Memorial Sloan Kettering Cancer Center. *An estimated 1,688,780 new cancer cases will be diagnosed in 2017. Approximately 50% of people with cancer are battling a rare cancer. Rare cancers include brain, pancreatic, ovarian, thyroid, and stomach cancers; leukemia and lymphoma; all pediatric cancers; and many others. Each year MSK treats more than 400 subtypes of cancer. As always, thank you for reading and remember… CHECK YOUR NECK!! Lastly, If you do donate to Cycle for Survival, please let me know and I’ll be sure to thank you personally on Twitter via my account (@LouiseASL). You can leave me a message here or connect via any of my social platforms. Thank you! And didn’t we meet in seventh grade? Here’s to sevenfold blessings and good health in the new year!